Epic in length at over 150 minutes and yet every single moment of this brilliant feature is soaked in dread, Hong-jin Na's The Wailing is a meticulously crafted horror film. Richly designed, expertly written and overwhelmingly creepy with just enough to disturb an audience. The aspect of this movie that impresses me the most is the fact that it manages to do so many different things rather than become overbearing due to being boorishly dour and one note. The Wailing is a murder mystery thriller with occasional moments of dark comedy and, of course, an unsettling zombie nightmare that unleashes some imagery that is impossible to shake. I will admit to hitting a very, very brief rough patch in the middle of The Wailing as I started to wonder if it could sustain such a daunting length, but before it could even really bother me I found myself becoming wrapped up in every scene until it ended. So many films call themselves horror and merely throw jump scares at our feet, begging us to react but it feels forced. So many films try to utilize gore and it makes me feel squeamish with no lasting effect, no real substantive reason to display such images beyond the desire to shock and disgust. The Wailing manages to do everything while truly feeling evil, and that is no small feat. The film tells the story of a quiet village in South Korea, a location going through the motions of life and seeming very much okay with this until a mysterious Japanese stranger appears in town. Perhaps coincidentally, perhaps not, right after his arrival a violent and terrifying sickness starts to spread among the villagers. The main character of the film is Jong-goo (Kwak Do-won), a police officer who is in charge of solving the mystery of what is causing the outbreak, and he requires the assistance of another officer and a priest who speaks Japanese, an obvious necessity as a translator for when they confront the stranger and discover whether or not their recent nightmarish circumstances are somehow his doing. Anyone turned off by the length of the film, in the end you don't feel it. I really thought I was going to get lost in the build up, but looking back on it, the film began building and constructing its mastery from the first frame on. 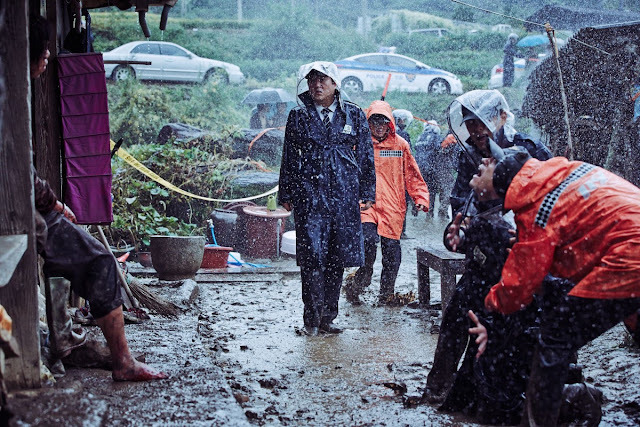 It's the moments that erroneously feel less important that lead to The Wailing feeling so wonderfully troubling and toxic in the end, aided by great performances and perfect cinematography. Cool! True the length of the movie is quite long however I like how it made me think what the three shamans real motive are and who is behind all this.